Jonathan Toews is putting the Chicago Blackhawks on his back and carrying them to the playoffs. Chicago's captain has stepped up his game when his team needed him most. Chicago won five games in a seven-day span from Sunday to Saturday, with Toews scoring goals and adding a pair of assists for nine points. The Hawks have risen to fourth in the West on the strength of an eight-game winning streak, during which he has 13 points while going plus-6. It's the kind of performance every team hopes for from its captain – stepping up when he’s needed most. Jarome Iginla -- Calgary's captain enjoyed perhaps his best week of the season, scoring 4 times and adding 3 assists for 7 points – including a pair of back-to-back three-point games. The big week bumped Iginla’s goal total to 29, leaving him just one short of becoming the 10th player in NHL history to reach the 30-goal mark in 10 consecutive seasons. Carey Price – Price led the Montreal Canadiens on a perfect trip through the Southeast, allowing only 3 goals on 116 shots in a 3-0-0 week that included wins at Atlanta, Florida and Tampa Bay. Martin Brodeur – Here's bad news for NHL shooters: Brodeur looks like his old self again. He started three games last week and won all three, allowing just one goal in each. Overall, Brodeur has won six consecutive starts and nine of his last 10. Lubomir Visnovsky – Visnovsky tends to fly under the radar when the discussion turns to top defensemen, but he's been invaluable for Anaheim this season. Visnovsky became the first Ducks defenseman to get a hat trick when he scored three times – including the winner in the final seconds of OT – to give Anaheim a big win Friday night. 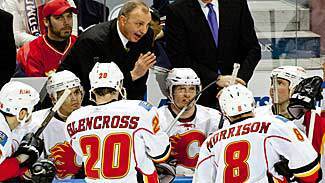 Andrej Sekera – Buffalo coach Lindy Ruff sat Sekera for three games after he went 19 games without a point. Ruff must have gotten his point across, because Sekera has four consecutive multi-point games, including a goal and an assist in Saturday’s 5-3 win at Philadelphia. Brandon Dubinsky – The New York Rangers can't afford the kind of slump Dubinsky has been mired in – no points in eight games, and no goals in 11. He's minus-4 during the pointless streak. Cam Fowler – Anaheim's prized rookie defenseman has had an excellent first season, but he's struggled over the past couple of weeks. Fowler has gone nine games without a point and is minus-8 in that span. Tomas Vokoun – It's been a tough time for Vokoun as the veteran goaltender has watched the Florida Panthers fall out of the playoff race. He lost three times in a seven-day span from Sunday to Saturday, was pulled in the first period of one of those games and has won just once in his last seven decisions. James Neal – The Penguins were thrilled to get Neal from the Dallas Stars, figuring he would provide more offense up front. It hasn't happened yet. Neal has played six games as a Penguin and has yet to produce a point and is minus-3. Eric Belanger – On a team that struggles to score, having a player who gets the amount of ice time Belanger does with Phoenix produce no points in six games isn't acceptable. He's on pace for 33 points, his worst offensive season since 2003-04. Injuries, news and notes -- Taylor Hall, the No. 1 pick in the Entry Draft last June, owns a Gordie Howe hat trick after getting a goal, an assist and a fight in Thursday's 4-2 win against Columbus. But the fight came with a price -- he injured his left ankle and didn't travel with the Oilers on their road trip. Out -- Rangers defenseman Ryan McDonough missed Friday's game with a knee injury. … Calgary center Brandon Morrison left Wednesday's game with a left knee injury and is day-to-day. … Boston forward Steven Kampfer is expected to miss a week with what the team calls a minor concussion. … Columbus defenseman Andrew Murray is out with a lower-body injury. The Jackets aren't saying when he might return. … Edmonton forward Ales Hemsky hasn't played since leaving Tuesday's game with a shoulder injury. … Ottawa forward Milan Michalek is out indefinitely with a foot injury. … Tampa Bay's Steve Downie missed Saturday's game with an ankle injury. … Minnesota forward Cal Clutterbuck will miss a few days with an upper-body injury. … Colorado forward Ryan Stoa is out for at least three weeks after undergoing an emergency appendectomy. … St. Louis defenseman Roman Polak sat out Saturday's game with a lower-body injury. … A lacerated right hand kept Jason Blake out of Anaheim's lineup on Friday. Returning -- Atlanta goaltender Ondrej Pavelec (wrist) returned to the lineup Saturday after missing three games. Forward Alex Burmistrov also returned from a broken foot. … Edmonton goaltender Nikolai Khabibulin dressed Saturday after missing 10 days with an eye infection. … Flyers forward Blair Betts was back on Thursday after missing two weeks with a lacerated finger. … Rangers defenseman Marc Staal also returned Thursday, his first action since going down with a knee injury on Feb. 22. … Colorado captain Adam Foote returned Saturday after missing 11 games with a leg injury. The Avs lost 10 of the 11 games. Still out -- New Jersey's Zach Parise began skating last Wednesday, the first time he's been on the ice since undergoing knee surgery in early November. He's still expected to need at least two more weeks before returning. … Anaheim goaltender Jonas Hiller saw another specialist last week as he battles vertigo. … Minnesota captain Mikko Koivu is skating again after being fitted for a protective cast for his broken finger, but still isn't nearly ready to return. … Ottawa captain Daniel Alfredsson says he hopes to play before the end of the season. He's been out since Feb. 7 with a lower back injury. … Atlanta center Jim Slater is still sidelined with a concussion that has kept him out for 29 games, but he skated last week and hopes to be back before the end of the month. … Islanders goaltender Kevin Poulin, out since Feb. 8 with a dislocated left kneecap, is walking without crutches but won't be back this season. … Washington goaltender Semyon Varlamov is expected to miss at least another week with a knee injury. Defenseman Tom Poti is still sidelined due to a lower-body injury. … Sharks defenseman Dan Boyle hasn't played since going down with a lower-body injury on Feb. 23. … Tampa Bay defenseman Mike Lundin (abdominal) is skating but still not taking part in practices. … St. Louis put forward Vladimir Sobotka on IR with a broken bone in his left foot suffered on Feb. 27. He's expected to miss at least four weeks. The Blues are also still without starting goaltender Jaroslav Halak, who's out with a broken right hand, and forward Philip McRae, who's on IR with a knee injury. … Coyotes defenseman Ed Jovanovski (facial fractures) hopes to resume skating this week. He had surgery two weeks ago and hopes to be back before the end of the season. … Nashville hopes to have forward Steve Sullivan (groin) and defenseman Francis Bouillon (concussion) back in a couple of weeks. Sullivan hasn't played since Feb. 24; Bouillon has been out since Jan. 16. … Detroit defenseman Brian Rafalski wound up sitting out all five games of the Wings' road trip with back spasms. … Colorado has shut down center Peter Mueller, who hasn’t played all season due to a concussion. The week ahead -- The regular season ends a month from Wednesday, and more than two-thirds of the 30 teams have legitimate playoff hopes. The Rangers are the only team that plays just twice this week -- and both of the Blueshirts' games are on the West Coast. Washington at Tampa Bay (March 7) -- Versus will be at the St. Pete Times Forum for the last meeting of the season between the top two teams in the Southeast Division as the Lightning try to fend off the Capitals. Boston at Montreal (March 9) -- The Bruins visit Montreal for the first meeting between the teams since they combined for 14 goals in Boston's 8-6 home victory a month ago. Minnesota at Nashville (March 10) -- The Predators return home after a five-game trip to host playoff rival Minnesota. It's the start of a season-ending stretch that will see them play 12 of their last 15 games at Bridgestone Arena. Buffalo at Toronto (March 12) -- The Sabres finish a seven-game trip with a visit to Toronto in a battle between two teams scrambling for one of the last playoff berths in the East. Chicago at Washington (March 13) -- The Hawks make their only visit of the season to the Verizon Center in NBC's "NHL Game of the Week." Edmonton Oilers -- The Oil heads East for one of the toughest weeks any team will face this season. Edmonton starts with a visit to Philadelphia, then visits Washington and Detroit before a Sunday afternoon date in Pittsburgh. Ottawa Senators -- The Senators start a four-game week in New Jersey and end it in Buffalo, with a two-game trip to Florida (Panthers and Lightning) in the middle. Vancouver Canucks -- The Canucks finished a six-game homestand last Thursday. This week, they begin in Phoenix, move on up to San Jose and finish with a Saturday night game in Calgary. Florida Panthers -- The Panthers get to spend a week in the warm weather, as Chicago, Ottawa and Tampa Bay come to South Florida. Pittsburgh Penguins -- The Penguins get to spend the week at home. They have two days off before Buffalo comes to the Consol Energy Center on Tuesday, then have two more days off before weekend games against Montreal and Edmonton. San Jose Sharks -- The Sharks are home for the second half of a six-game homestand, with Nashville, Vancouver and the New York Rangers coming to Northern California.